Building my PLN, or Professional Learning Network, has been one of the best decisions I’ve made since I started teaching! Being connected with fabulous educators through blogs and Twitter means I have an excellent network of colleagues and resources to inspire me to improve my instruction. And last week, I experienced a fantastic, problem-solving PLN win! Disclaimer: This post contains affiliate links, which means if you purchase an item after clicking on a link, I will receive a small commission. See Disclosures & Disclaimers for more information. I spent WAY too much time tracking which library centers students were at, and not enough time facilitating the learning that was happening. I kept a record of student center choices on a Google spreadsheet, and I also stamped each student’s center tracking booklet so that they can visualize their learning. Ideally, I recorded where each students was (that “all-important” data), AND had time to encourage/scaffold students who were struggling, re-direct students who were off-task, and challenge students who were coasting. In reality, the data collection took almost every second of my time during the 25-ish minutes of library centers. I still “checked in” with students when I stamped their booklets, but only for about 5 seconds. 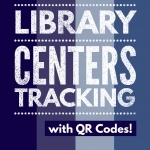 In the past year, I had read this blog post on QR codes for tracking library visits by Ms. O Reads Books, and her follow-up blog posts explaining how to do it Then, I remembered this blog post by Vicki Davis about using every last instructional moment. I wanted to use every minute as efficiently as possible, and cram as much (fun) learning as possible into a 40-minute library class. 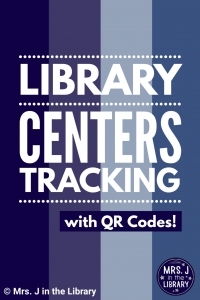 Connecting the two blog posts, I had a flash of inspiration and found my solution: Library Center Check-in with QR codes! Ms. O’s idea of using QR codes to “sign in” at the library has been floating around my brain for months. It takes some tech tricks to set up, but basically, several Google forms collect their responses in a single spreadsheet. Each form asks for the student’s name and teacher’s name. That’s it! Some of the forms for makerspace centers have one additional question such as, “What are you working on today?”, but I tried to keep it very short, because one tablet is shared among several students. I created a QR code for each form using the Kaywa QR Code Generator, printed the codes on Avery 2″ x 2″ square stickers, and stuck the code onto the center signs with a large “Check in” sticker (printed on address labels/barcode labels). The stickers hide some of the clipart on my center directions signs, but they are functional nonetheless. I tried it with each class in grades 3-5, and it was a HUGE success! The entire “check-in” process takes less than a minute of each student’s time. I’m relying on students to report their center choice honestly, but I also have the “double-check” of the booklet stamps. I’m thrilled with the results because now I’m able to do more teaching/facilitating/scaffolding and less data collection during classes. As an added bonus, I showed one of our district tech coaches to get some feedback, and she liked the idea, too. Yay for advocacy!! Have you used QR codes in your library or classroom? If so, please share your experience and any tech tricks you learned in the comments! We use Qr codes to turn in all projects completed in the library. I post the Qr code with the Title of the project and students scan the code to post their projects to a padlet. Awesome idea, Julianne! I love QR codes for that reason…they are simple and easy for students to use! It takes much of the hassle out of using tech in class, even if it requires the extra work up front.